If you’re eager to get away this summer but feel constrained by the demands of your budget, fear not – the aptly named staycation could be the solution for you! The UK is bursting with locations to enchant holiday-makers of all persuasions; from sandy beaches and thriving cities, to rugged mountains and forests. Taking time to get away and recharge doesn’t have to cost the earth, so why not save yourself the expense and hassle of travelling abroad this year by exploring one of these budget-friendly UK holiday spots? Firstly, book early. Train tickets and hotels are cheaper well in advance, so try to be as organised as possible! Investing in a rail card if possible could also help you save. The 16 – 25 railcard costs around £30, but since it saves you a third on rail fares you can easily make this back, and more, in a single journey. Accommodation is the biggest single cost to think about when booking a holiday. Hotels are lovely, but if you find yourself on a budget they might not be a great option. Fortunately, hostels are here to help! Many of them are springing up around the UK, and en-suite bathrooms are quickly becoming the norm. Many hostels offer private rooms as well as dormitories, so it’s really just a hotel, but much cheaper – and with bunk-beds! In larger groups, you could split the cost of a self-catered apartment. Since you could cook here too, you’ll save yourself loads by making breakfast yourself, or the odd dinner. Food is another area where you can easily save without relinquishing the chance to try local cuisines. Try making lunch your biggest meal, or at least eat dinner early. Many restaurants have lunch and early-bird deals which don’t apply later in the evening, so just adjusting the time you eat can save you tens of pounds a time. Supermarkets are also a godsend for the budget traveller, as you can stock up cheaply on drinks and snacks so avoid paying through the nose for them at the attractions you visit. If you love history, York has got you covered. It’s home to a whole host of free and low cost attractions, and you can book yourself a cosy Bed and Breakfast from £30 per night. 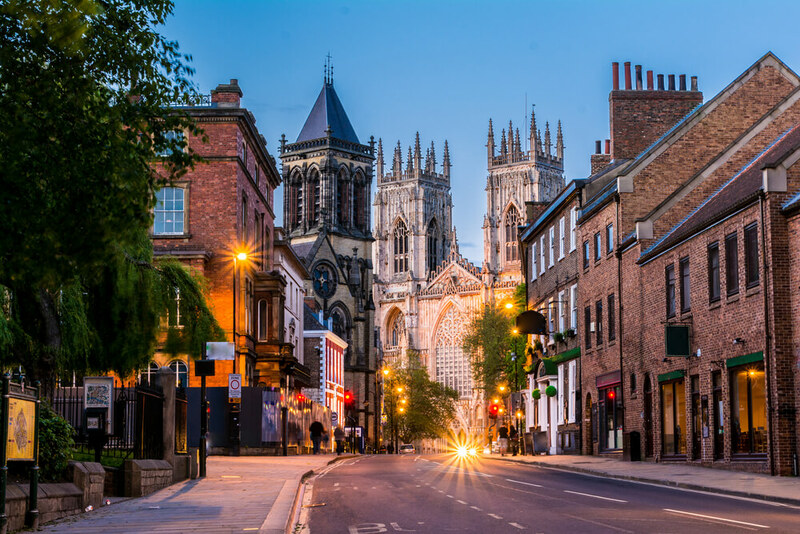 York’s most famous feature is probably the minster – a stunning fourteenth century cathedral which you can explore for a voluntary donation. You can also browse the York Art Gallery for under a tenner, and see the world’s largest collection of works by local artist, William Etty. Taking advantage of the scenic river Ouze is another great way to see the city, and tours start form only £8. For something a little spookier, try a ghost tour! These usually cost around a fiver, and take you through York’s winding streets whilst regaling you with its most sinister tales, as well as a fair helping of history. Who says you have to go abroad to enjoy a beach holiday? Tourists have been flocking to Brighton for centuries to enjoy the sea, sand (well, pebbles!) and, occasionally, sun. A grand total of 98 parks and gardens can be accessed in the area, so all your cravings for the great outdoors will be satisfied. On rainy days you can watch the downpour from the safety of Brighton’s museums and galleries. Free to access, the Brighton Museum and Gallery boasts a rich collection of costumes and textiles. The near-by Hove museum is a great option for families, housing one of the most extensive toy galleries in the country!Accommodation can be had for the reasonable sum of £29 per night self-catered, or £125 for a family room in a local hotel. Good food can also be had on a budget, with locals and tourists alike recommending the famous Planet India restaurant, where authentic Indian food meets purse-friendly prices. Further north, sits the picturesque capital of Scotland. There is plenty to see and do in Edinburgh which is completely free! Visiting the Royal Botanic Gardens gives you a glimpse of the exotic without having to travel abroad. The host of beautiful hot-houses feel like stepping into the rainforest, and allow visitors to learn all about their exotic inhabitants. You could also take a stroll around St. Giles cathedral, the city’s religious focal point for 900 years, or immerse yourself in the National Gallery of Scotland. Its vast collection of art will satisfy the culture vulture within, with works ranging from Renaissance to Modernist masterpieces. Edinburgh is also home to plenty of cheap eats, including the famous Henderson’s vegetarian restaurant, and hosts an abundance of friendly hostels, with luxury private rooms starting from £50. For those who prefer to avoid the bustle of the city. The rolling hills and clear lakes have drawn visitors for centuries, and the main attraction – beautiful scenery – is free for all! Accommodation can be expensive during the summer, so consider a spring trip, or travel in autumn to witness a beautiful blaze of colour. For rainy days, the area is also home to a plethora of tea-rooms and museums. You could visit Keswick’s Museum and Gallery, or take in a show at the scenic Theatre by the Lake. Shopping around for a B&B is the cheapest way to stay in this beautiful part of the country. Staying in Britain is a great way to save money whilst still giving yourself a break, but if you find yourself struggling with debts the swap might not be enough. If this is the case, seeking help is the best option, and an IVA – Individual Voluntary Arrangement – could be a good solution for you. This works by reducing your monthly payments to an amount that’s affordable for you, and ends up writing off your debt entirely. Debt can affect anyone, but luckily help is out there. In the meantime, happy travelling!